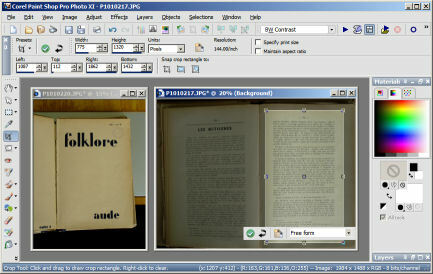 One of the goal of Italian Gruppo di Studio e Documentazione su Rennes-le-Château is to recover and "digitally" restore the documents related to Bérenger Saunière enigma. An example of restoration is here explained. On June 7 2007 I have spent a day at the Archives Departimentales de l'Aude in Carcassonne (how to get there), where I could see and take some photos of a great number of articles, manuscripts and old books about Rennes-le-Château and its history. The user is allowed to take photos or to scan with his own tools (for free) all the material stored at the Archives. After having found in the files the code (in French, le côté) of the Folklore review (22PER) and the one of the year 1938 (2), I made a request of the document coded 22PER2. It arrived in a quarter of hour, enclosed in a protective sheet of paper. With a simple camera (1.3 Megapixel) I took some photos of the cover and of page 137, where a strange legend is told about a sheperd in Rennes-le-Château who meets a ghost lamb. The legend could be at the origin of Ignace Paris' legend (see here for an Italian summary of the legend) and the publication data of the review (1938) is particularly interesting, considering that - at that time - Rennes-le-Château was only a poor and forgotten village. After a digital work of restoration, performed with Corel PaintShop XI, I printed a PDF version of the two pages, so making them available to the researchers.